Telecoms.com catches up with Ericsson CEO Hans Vestberg at the Ericsson Business Innovation Forum in Stockholm. Vestberg is keen to focus on the journey Ericsson is on to transform itself into a broad-based ICT company and to detail some of the milestones and challenges that entails. “We are the clear number one in mobile infrastructure and services, and what is happening in the whole industry is the move to data and the need to transform. 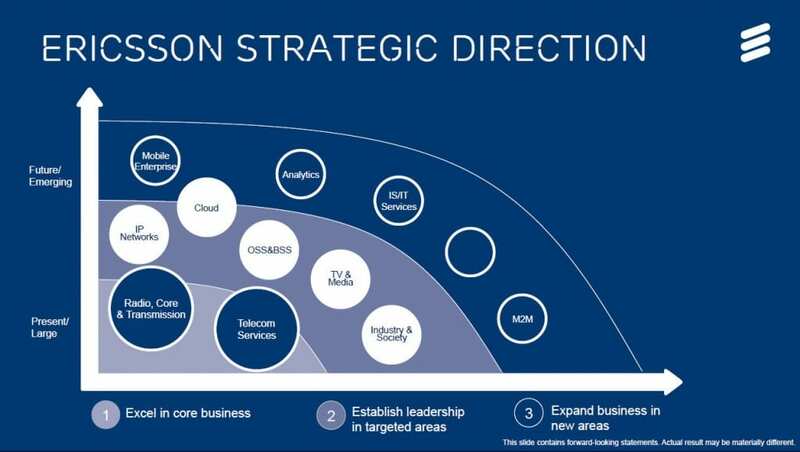 So then we have these five areas where we are establishing our leadership,” says Vestberg, referring to the Ericsson strategy slide below. Moving into new areas such as software, cloud, media, etc, presumably puts Ericsson in competition with companies that used to be allies, so who does Vestberg see as his new competitors? “In our traditional area – mobile infrastructure – Huawei is our main competitor, but we are still twice the size of them when it comes to revenue,” says Vestberg. “In services, given that we’re going from installation to consulting and system integration, here we meet companies like HP, Atos, Accenture, whoever. If I talk to my guys in TV and media it’s such a fragmented market, in OSS/BSS you have Amdocs, Oracle, on IP networks you have Cisco, Juniper, ALu, so it’s very different. Vestberg agrees that Ericsson picked a good time to get out of handsets, but not that innovation has stalled in that sector. “If you look at the mobile industry over 20 years, the phone was initially an extension of the network – you couldn’t sell a network if you didn’t have phones. Then 3G and smartphones came and suddenly the device became something different, which has been on-going for 6-7 years. Getting out of handsets had advantages over and above leaving an incredibly competitive market, it also opened up the opportunity for new partnerships. “Suddenly, when you drop smartphones, you realise that if you are having 50 per cent of all the traffic in the world, any smartphone vendor would like to work with you to understand how the phones are working,” says Vestberg. “So of course we’ve extended our partnership with all the handset manufacturers enormously in the last four years. I would say any smartphone vendor in the world would have their phones in our labs 6-12 months before they hit the market to test them against 4G, 4G advanced, so see that there are no bugs, because you can’t do that with just one carrier. “Also five years ago I wouldn’t have dreamed about why I should work with Facebook, but today Ericsson has its own door into Facebook where it says ‘Ericsson’. Inside there is a 2G network, a 3G network and a 4G network, and Facebook is trying out all their apps, first on 4G then 3G then 2G. But let’s not forget about Ericsson’s core customer base – the operators. How does Vestberg see them continuing to grow in this new, more ICT-focused mobile market? “At Ericsson we have never previously segmented our customers,” he says. “It sounds strange but they bought the same stuff and they were the same. “If you think about a simple network today, you have a network, you have an IP stack, you have applications and services and on top of that the devices. What we see right now is three types of operators that want to act very differently in the market. You have the ones that we call network operators, that focus just on the network and leave everything that is on top of the network. They don’t want to grow much on sales or profit and are looking for a good return on capital investment.